Industrial action by the Italian metal workers union meant that the Ferrari team were unable to compete at Rouen, leaving the race a straight battle between the British and the Germans. 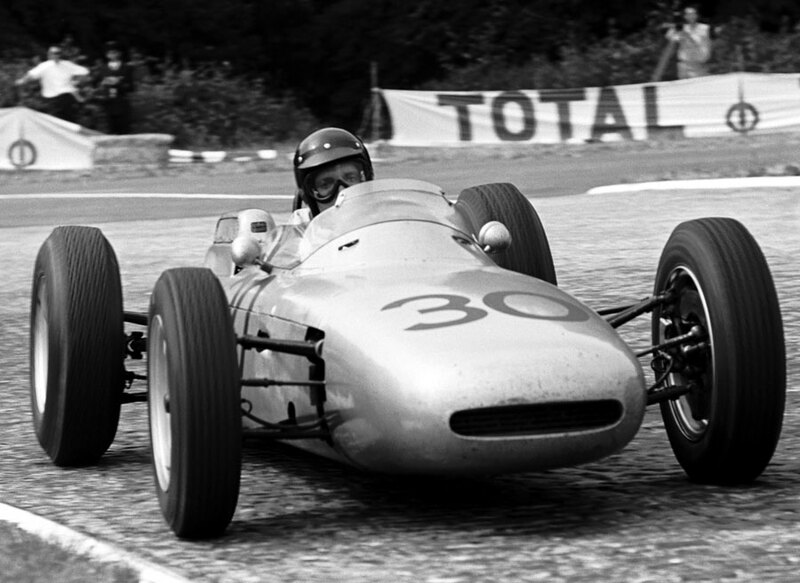 Porsche won out this time, securing their first and only Formula One win with Californian Dan Gurney at the wheel, also winning for the first time. The picturesque woodland Rouen circuit was remarkably tough for the drivers - narrow and tortuous and extremely rough in places. So much so, that some drivers reported blurred vision at high speed, due to excessive vibration of the cars. As had become the norm that season, British cars dominated practice with Jim Clark taking pole in the Lotus 25 ahead of Graham Hill's BRM and Bruce McLaren's Cooper Climax. Hill outgunned Clark at the start and raced into an early lead, with John Surtees on his tail for the first three laps. After 10 laps British cars were still holding the first five places, and then Surtees had to make a pit stop, allowing Clark to move up to pressure Hill in the lead. Gradually the German threat developed as the Porsches made their way through the field to third and fourth, and when Clark came into the pits at around halfway, Hill had Gurney's Porsche breathing down his neck. When Hill stopped on the 42nd lap with throttle trouble, Gurney had a clear lead over Surtees and South African Tony Maggs in a works Cooper Climax. A lap later Surtees was in the pits and Maggs was through into second, and with only 10 laps to go was able to hold on to score his first championship points, even though he finished over a lap behind Gurney. The tough, twisting course had taken a toll on the 17 starters, with only nine cars crossing the finishing line. Porsche's win was the last by a German constructor until Robert Kubica won the Canadian Grand Prix in 2008, in a BMW Sauber. Despite not racing due to the Italian strike, Phil Hill was still second in the championship standings, just two points behind Graham Hill, with McLaren alone in third.